We extended our stay in the Pensacola area for another week because of a Motor Coach windshield replacement and some emergency dental work for Pam. 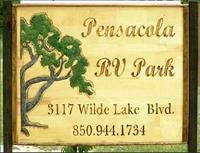 We moved to this RV park to be closer to downtown Pensacola. 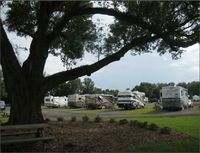 I found it doing a Google search on "RV Parks near Pensacola, FL. This one was convenient, had a good review and very economical. New having opened only a year ago. What a surprise. Clean, uncluttered, nicely manicured, close to Interstate 10 (but far enough away to be quiet) and extremely friendly and helpful owners. I would recommend it for anyone. Weekly rate is $211 ($28/day plus tax).